Redshirt freshman Ricky Henrilus rushed for 109 yards on 10 carries and had a big hand in bringing the Rattlers within reach of a win. 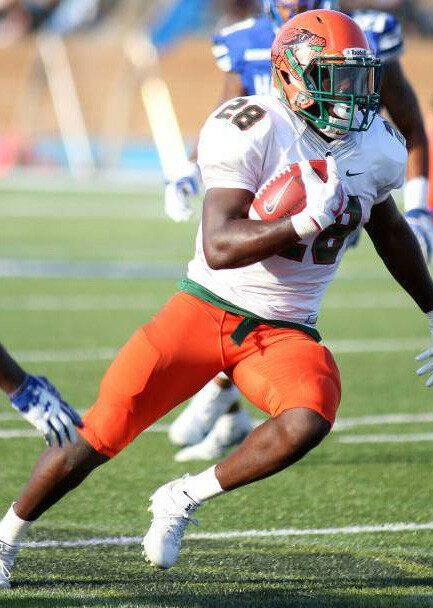 HAMPTON, Va. – FAMU’s football coach Alex Wood was so frustrated with the way the Rattlers lost to Hampton to extend their losing streak that he didn’t hold his tongue. Nothing bothered Wood like the 14 penalties committed by the Rattlers in the 31-17 loss. With three games remaining, FAMU (2-6, 1-4 MEAC) is guaranteed to finish with another losing record under Wood, who is in the final year of a three-year contract. The Rattlers will try to snap the skid Saturday at Morgan State. The Rattlers had an opportunity to win with 5:40 left in the game. They drove 55 yards on 12 plays to the Hampton 16-yard line. Wood decided to gamble on fourth-and-3, giving the ball to the team’s leading rusher Devin Bowers. He was stopped a yard short of the end zone. The setback overshadowed a valiant effort by the Rattlers in the second half, which saw much of their young talent flash enormous potential in the comeback bid. Redshirt freshman halfback Ricky Henrilus was scintillating, rushing for 109 yards on 10 carries, running with both speed and power, and literally willing the Rattlers back into the game. Another redshirt, former Rickards High star receiver Chad Hunter, made a spectacular 91-yard touchdown catch of a Ryan Stanley pass, snaring the ball and racing through the Hampton defense into the end zone with 7:23 left. That gave the Rattlers their only lead, 27-24. Hampton (5-2, 4-0 MEAC), which led 21-3 midway through the second quarter, retook the lead with 5:46 left in the game on Delmon Williams’ eight-yard TD pass to Quinton Lee, for a 31-27 edge. NOTEWORTHY: The Rattlers outgained the Pirates, 416-405 in total yards, buoyed by their 265 yards in the second half, sparked by Henrilus, who rushed for 75 yards on just eight carries in the second half… Bowers finished with 65 yards on 18 carries, while Ryan Stanley passed for 220 yards on 13 of 19 passing, tossing a trio of TD strikes, against no picks. Stanley threw a pair of TD passes to Chad Hunter (six yard, 91 yards) and one to Kareem Smith good for 16 yards. Chaviss Murphy led the Rattler receivers with four catches for 59 yards, followed by Chad Hunter with two grabs for 97 yards and two TDs. Redshirt freshman kicker Khalil Clark of Tallahassee Lincoln hit a pair of field goals in the game, a 22-yarder for FAMU’s first points of the game with 25 seconds left in the first period, and a 35-yarder to open the fourth quarter. Linebacker Jakaris Wilson had a season-high 15 total tackles Saturday against the Pirates, including seven (7) solo stops, one sack and one tackle for loss.